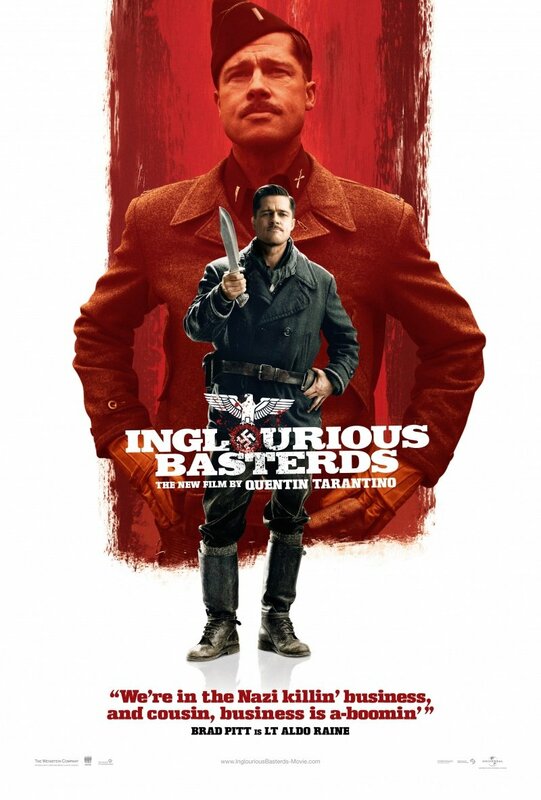 I saw Inglourious Basterds with my sister yesterday evening (the 10:15pm show that ended around 1am), and I must say that I will be buying this movie. The main thing that gets me with Tarantino movies is the gore. Some might say that the amount of blood is comical, but I just can't handle it (As I type that, I can't help but giggle. One of my favorite trilogies is Evil Dead.). That's my first opinion for this movie. It wasn't a gore-fest. There were, of course, points at which I closed my eyes and covered my face until the squishing or slashing sounds dissipated, but in a normal Tarantino film, this would have happened numerous times. I would have probably missed 50% of the movie. It's one of the reasons that I don't really watch scary movies, either. Give me a rom-com with a happy ending, thank you. Ok. So we've decided that the gore factor was acceptable. What else? The characters created for this film were brilliant, and I very rarely say statements like that. Brad Pitt's character alone would get me to see this movie again. It wasn't only him, though. The whole cast was great, and they performed so very, very well. On top of that, they were given exemplary dialogue and plot devices. I don't want to ruin it for anyone that sees it, but I'd like to say "bonjorno" to all of the people who have seen it. If you don't want to spoil the movie, do not read any further. I am going to talk pretty in-depth about the storyline and whatnot, so run away quickly if you want to enter into the movie completely ignorant to its contents. Maj. Dieter Hellstrom: That was the sound of my Walther pointed right at your testicles. Lt. Archie Hicox: That makes two of us. Sgt. Hugo Stiglitz: That makes three of us. Another great thing about this movie is that it took historical fact and threw it completely out of the window. Instead of killing himself in a bunker, Hitler is shot to death by two of the Inglourious Basterds with dynamite strapped to their ankles. This dynamite, of course, goes off soon after in a fantastic display of special effects. And we all know we love to see a movie theater blown to bits. Well, we love to see anything blown to bits, really. All in all, this was a great movie, and I highly recommend it. Two thumbs way, way up, Ebert and Roeper! Lt. Aldo Raine: I need to know about Germans hiding in trees. And you need to tell me right now. Sgt. Werner Rachtman: I respectfully refuse, sir. Lt. Aldo Raine: Actually, Werner, we're all tickled to hear you say that. Quite frankly, watching Donny beat Nazi's to death is the closest we ever get to going to the movies. Sgt. Donny Donowitz (also known as The Bear Jew): [from offscreen] Yeah? Lt. Aldo Raine: Got us a German here wants to die for country. Oblige him. P.S. Go see the movie. I can't wait to see the movie now that I read your review!! I saw the Julie & Julia movie and I didn't think it was that great - good for DVD though. But this one sounds amazing~!!! I'm glad to hear that it wasn't overly gory. I was interested in the premise, but was scared about the level of blood and guts. I typically like a scary movie, but after seeing Hostel a few years ago, I've been a little wary of Tarantino. (I also didn't enjoy Pulp Fiction that much-so you're not alone!) I may have to give this one a try. Thanks.